File contains a short story by Joyce Barkhouse. File also contains related correspondence regarding publication in Canada's Ordinary People. 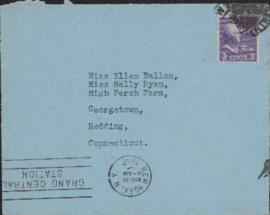 File contains a letter from Edna Ferber in response to a birthday telegram sent by Ellen Ballon, Sally Ryan, and Ralph Gustafson of High Perch Farm, Georgetown, Connecticut.